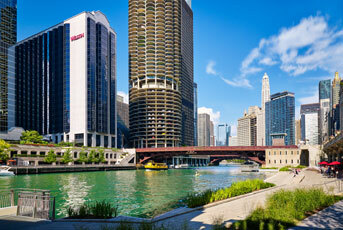 To book your room(s) at the Westin Chicago River North, click here. You do not need to enter a group code, as the form will pre-populate. To make reservations by phone, please call +1-888-627-8359 and request the DATAVERSITY group rate at the Westin Chicago River North. If you need assistance booking a room for the conference, please call us at +1-310-337-2616 x1 or email us, and we will do our best to help. Midway International Airport is approximately 13 miles from the hotel. O'Hare International Airport is approximately 17 miles from the hotel.